Update November 2, 2018 – New features: Buttons on response cards, eliminate need to retrain Alexa skills for new question, and minor UI improvements. Update June 1, 2018 – New features: Markdown (rich text), SSML (Speech markup), usage and user feedback logging and dashboard. Update May 10, 2018 – New version of QnABot that contains bug fixes, a new look for the user interface, and additional features, including support for follow-up questions and extensibility with Lambda hook functions. Your users have questions and you have answers, but you need a better way for your users to ask their questions and get the right answers. They often call your help desk, or post to your support forum, but over time this adds stress and cost to your organization. Could a chat bot add value for your customers? Interestingly, a recent poll shows that 44% of people would rather talk to a chat bot than to a human! In this post we provide a sample solution, called QnABot (pronounced “Q and A Bot”). 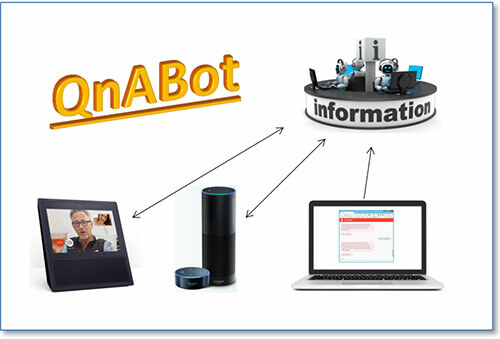 The QnABot uses Amazon Lex and Amazon Alexa to provide a conversational interface for your “Questions and Answers.” This allows your users to ask their questions and get quick and relevant answers. Amazon Lex lets you integrate both voice and text chat access into your existing applications. Amazon Alexa allows you to offer a hands-free voice interface to your users in their homes or workplaces using Amazon Echo or any Alexa-Voice-Service-enabled device. QnABot offers the best of both worlds. QnABot uses the Amazon Elasticsearch Service (Amazon ES) to make your questions and answers searchable. When a user asks a question, the Amazon ES powerful full-text search engine is used behind the scenes to find the answer that is the best match for that question. Deploy QnABot to your AWS account. This blog assumes that you are already an AWS customer. If you want to open an account, choose the Create an AWS Account button on the AWS home page. Populate the QnABot with your questions and answers using the Content Designer UI. Ask questions using voice or chat with the Web Client UI. Ask questions hands-free using the latest Amazon Echo devices. Enrich your answers with images , rich text, and SSML. Extend QnABot to integrate with other services and deliver dynamic answers. Troubleshoot and tune QnABot content to minimize the chances of getting wrong answers. We’ll also take a look under the hood to show you how QnABot works, and give you some ideas for how you can enhance it to suit your needs. Open the AWS CloudFormation console, and on the Parameters page, enter a valid Email and Username for the QnABot Content Designer admin user. Select the acknowledgement checkbox, and choose Create to deploy QnABot. Amazon Elasticsearch Service domain to store and search your content (2 x t2.small.elasticsearch). Cost approx. $0.072/hour. NOTE: For more information, see Configuring Amazon ES Domains. Amazon S3 buckets to host the QnABot web UIs. Amazon Lex Bot to provide natural language processing. AWS Lambda functions used to administer QnABot content and to find answers to questions. Amazon API Gateway APIs used by the web UIs. Amazon Cognito configured to authenticate clients and provide temporary AWS credentials. DashboardUrl: URL to launch the CloudWatch dashboard for monitoring. You will receive an email at the email address you provided with the subject “QnABot Signup Verification Code.” This email contains a generated temporary password that you can use to log in and create your own password. Your new password must have a length of at least 8 characters, and contain upper-case and lower-case characters, plus numbers and special characters. You need to load some question and answer data using the Content Designer, before turning QnABot over to your users. Your data is stored in Amazon ES behind the scenes. This way, the data can be searched later when users ask questions using either an Amazon Lex client UI or an Alexa hands-free device. The steps that follow show you how to load sample questions used to illustrate the features of the QnABot. You can easily substitute your own content later. NOTE: Use a naming convention to identify your items within categories. Enter the answer: The Q and A Bot uses Amazon Lex and Alexa to provide a natural language interface for your FAQ knowledge base, so your users can just ask a question and get a quick and relevant answer. Choose the CREATE button (bottom right of the card). Repeat steps 3-7, entering the items from the table below. When the import is complete, choose Edit from the top left tools menu ( ☰ ), and then choose LEX REBUILD from the top right edit card menu ( ⋮ ). NOTE: We will describe the purpose of the LEX REBUILD later in this post. QnABot.002 How do I use Q and A bot Create and administer your questions and answers using the Q and A Bot Content Designer UI. End users ask questions using the Amazon Lex web UI that supports voice or chat, or using Alexa devices for hands free voice interaction. Admin.001 How do I modify Q and A Bot content Use the Content Designer Question and Test tools to find your existing documents and edit them directly in the console. You can also export existing documents as a JSON file, make changes to the file, and re-import. Admin.002 Can I back up Q and A Bot content Yes. Use the Content Designer to export your content as a JSON file. Maintain this file in your version control system or in an S3 bucket. Use the Designer UI Import feature to restore content from the JSON file. Admin.003 Can I import Q and A Bot content from a file Yes, the Content Designer has an import function that lets you load items from a formatted JSON file. You can create JSON files using the Export feature, or you can write your own tools to create JSON files from existing content such as a website FAQ page. Admin.004 How do I troubleshoot and fix problems with Q and A Bot. Use the Content Designer test tool to test a question, and check what items are returned, ranked in order of score. If the desired item does not have the highest score, then add the question to the item and run the test again. The desired item should now have the highest score. Take care not to create items with duplicate questions, to avoid unpredictable responses. Admin.005 How can I find specific Q and A items in the Designer UI Use the Filter feature in the Questions tab to filter the items list based on the ID field. Or use the Test tab to list all the items that match a question. Media.001 How can I include pictures in Q and A Bot answers Add an image attachment to the item using the Content Designer. You can launch QnABot from a Chrome, Firefox, or Microsoft Edge browser on your PC, Mac, Chromebook, or Android tablet. On the CloudFormation console, select the main QnABot stack, choose Output, and then choose the link to the ClientURL. Alternatively, launch the client by choosing QnABot Client from the Content Designer tools menu ( ☰ ). You can interact with QnABot using either text chat or voice. The bot will respond with the answer you previously entered for this question. QnABot also works with Alexa, allowing your users to get answers from your content via any Alexa enabled device, including Amazon FireTV, Amazon Dash Wand, and any of the Amazon Echo family of devices. Follow the displayed instructions, step by step, to create an Alexa skill in your Amazon account. It will take you just a few minutes. You can test your new skill in the Amazon Developer Console, even if you don’t have an Alexa enabled device handy. If you want to publish your QnA skill to the Alexa skills store so other users can access it, see Submitting an Alexa Skill for Certification. Unpublished skills are accessible only to Alexa devices registered to your Amazon account, while published skills are available to anyone. You can easily augment your answers with image attachments that can be displayed on a user’s Lex Web Client UI, Amazon Alexa smartphone app, or new Amazon Echo Show device touch screen. Use images to display maps, diagrams, or photographs to depict places and products relevant to the question. Enter answer: Echo Show brings you everything you love about Alexa, and now she can show you things. She is the perfect companion for Q and A Bot. Choose CREATE to save the new item. You’ll see the photograph displayed in the web UI chat. 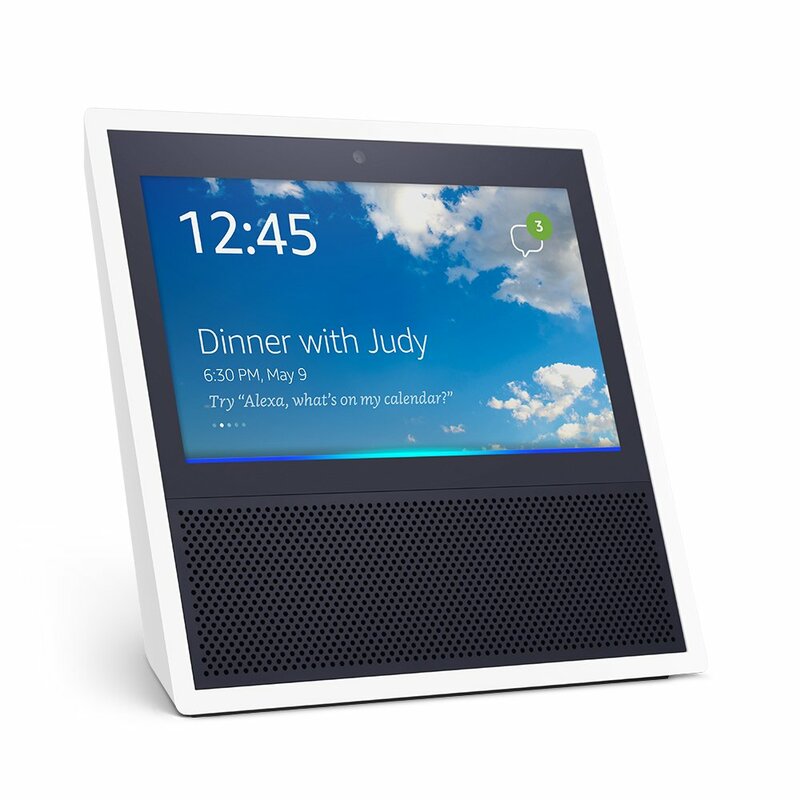 Or, use an Amazon Echo or Echo Dot to say: “Ask Q and A, What is an Echo Show?” The card shown in the Alexa smartphone app shows the photo attachment. The photo attachment is displayed on the Echo Show’s touch screen. Use Amazon S3 or a photo sharing service to host your images (see hosting images). The latest version of QnABot supports Markdown, allowing you to create beautiful rich text versions of your answers for displaying on the Web UI client. To use this feature, populate the ‘Alternate Markdown answer’ field in Content Designer. The Q and A Bot uses [Amazon Lex](https://aws.amazon.com/lex) and [Alexa](https://developer.amazon.com/alexa) to provide a natural language interface for your FAQ knowledge base. Now your users can just ask a *question* and get a quick and relevant *answer*. Use the Web UI to ask: “What is Q and A bot?”. You will see that the answer now displays the heading, links, and emphasis specified in your Markdown text. Enter question: What is Amazon Fire TV? Enter answer: Fire TV brings all the live TV and streaming content you love, and Alexa, onto the big screen. Use Alexa on the Fire TV to bring QnABot into your living room! **Fire TV** brings all the live TV and streaming content you love, and Alexa, onto the big screen. Use Alexa on the Fire TV to bring QnABot into your living room! Use the Web UI to ask: “What is Amazon Fire TV?”. Markdown support currently works only with the latest version of our chatbot web UI. The latest version of QnABot supports SSML, giving you additional control over the speech generation for your response. To use this feature, populate the ‘SSML answer’ field in Content Designer. Use the Web UI to ask, using voice: “What is Q and A bot?”, and listen to the whispered response. Using SSML answers gives you control over voice responses for both Lex and Alexa. When you are using the web UI, you can use both Markdown and SSML to get QnABot to say one thing (SSML) while displaying another (Markdown). Use this feature to deliver short punchy verbal answers, while taking advantage of the web UI to display rich, illustrated answers. QnABot remembers the topic from the last question you asked, allowing you to ask follow-up questions, for example: “How much does it cost?” The correct answer depends on the context set by the previous question. To use this feature, you assign a value to the Topic field in Content Designer. In Content Designer, edit item Alexa.001 (“What is an Amazon Echo Show”), and enter “EchoShow” as the Topic in the Advanced section. Choose UPDATE (bottom right) to save the item. Edit item QnABot.001 (“What is Q and A bot”), and enter “QnABot” as the Topic. Choose UPDATE to save the item. Enter question: How much does it cost? Enter answer: For latest prices on the Echo Show, see the Amazon retail site or shopping app. The answer to this question now sets the conversation topic to ‘EchoShow’. The topic disambiguates this question, so it responds with the answer for the Echo Show. This question changes the Topic to ‘QnABot’. The new topic allows the QnABot to respond with the correct answer. Enter Button Value: What is Q and A bot? Enter Button Value: What is Amazon Fire TV? As you define your content, be sure to make your answers light and engaging. Try to adapt a consistent style in your answers. Use images to augment verbal answers. Add flourish to make your bot friendly and stylish! For example, teach it how to respond to chit-chat like ‘Hello,’ Bye-bye,’ ‘Thanks’ and more. Log in to the Content Designer, and choose Add. Enter answer: Greetings friendly human! Ask me a question. Try to stump me. Use the Web UI, or any Alexa device to say “Hello” to your bot, and listen to it respond. Content Designer now gives you the ability to dynamically generate answers by letting you specify your own Lambda ‘hook’ function for any item. When you specify the name of a Lambda function in the Lambda Hook field for an item, QnABot will call your function any time that item is matched to a user’s question. Your Lambda function can run code to integrate with other services, perform actions, and generate dynamic answers. Log in to the Content Designer, and choose Import from the tools menu ( ☰ ). Open Examples/Demos, and choose LOAD from the ‘hook’ example. When the import job has completed, return to the edit page, and examine the item “Help.” Note that the Lambda Hook field is populated with a Lambda function name. Inspect the example function (qna-QnABot-hello-JS) using the AWS Lambda console. Choose Lambda Hooks from the Content Designer tools menu ( ☰) to display additional information to help you create your own Lambda hook functions. QnABot attempts to match a user’s question to the list of questions and answers stored in Amazon ES by the Content Designer. QnABot uses Amazon ES full text search to find the item that is the best match for the question asked. Words that are used infrequently score higher than words that are used often, so sentence constructs such as prepositions have lower weighting than unique keywords. The closer the alignment between a question associated with an item and a question asked by the user, the greater the probability that QnABot will choose that item as the most relevant answer. QnABot tries to find the best answer to questions by matching the user’s question to both the question and the answer fields of the stored items, giving more weight to any matches found in the question field. Scores for matches across multiple questions in an item are additive. To avoid undesirable skew in the scoring, make your questions as unique as possible and avoid repeating words or phrases. You might find that users ask questions in ways that you haven’t anticipated, resulting in unexpected answers being returned by QnABot. When this happens, use the Content Designer to troubleshoot and fix the problem. Use the Lex Web UI (voice or text chat) to ask the question in a different way: How can I edit items? Ideally you want the answer for item Admin.001, but in this case, since the question is phrased very differently than the question associated with this item, you don’t get the desired answer. Enter the same question you asked, “How can I edit items”, into the question field, and choose SEARCH. Observe that the highest scoring answer is not Admin.001. Now find and choose the lesser ranked Admin.001. This is our preferred answer. Enter the new question: How can I edit items, and choose the UPDATE button (bottom right of card). Try the same question again, by choosing SEARCH (top of the page). Success! This time Admin.001 has the highest score. Try asking the question again in the Lex Web UI. This time you’ll get the desired answer. However, occasionally you might find that you want to say things to QnABot that it doesn’t understand and is unable to process. You might notice that the transcription shown in the web client or the Alexa app isn’t accurate, or that QnABot asks you to repeat what you just said. If this happens, it is time to re-train the NLP. QnABot can generate additional training data automatically using questions from all the items you have added. In the last exercise, QnABot returned the wrong answer, but this time, it simply replies: “Sorry, can you please repeat that.” If you repeat the same statement, you will continue to get an error message. 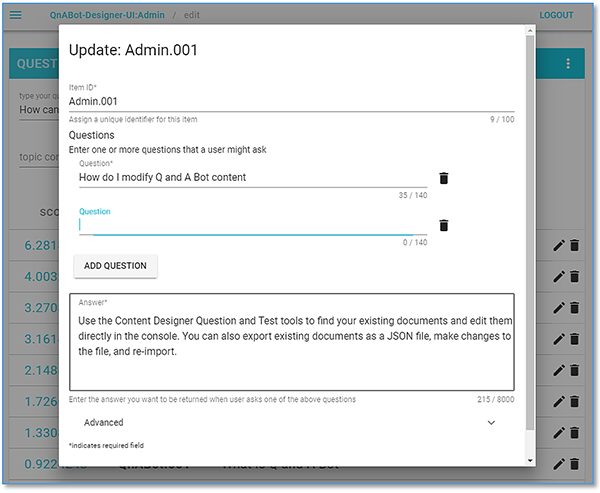 Log in to the Content Designer, open item “Admin.001,” choose the edit tool (right), choose the ADD QUESTION button, and add the statement as a new question: Need to change some answers. Save the update using the UPDATE button at the bottom of the card. Choose Lex/Alexa, then choose Rebuild Lex Bot. Wait for the rebuild to complete. Now try again, using the Lex Web Client UI to state “I need to change some answers.” Since the new statement has been added to the QnABot training set, you’ll see that it is no longer rejected, and that QnABot now responds with an appropriate answer. Good news! The latest version of QnABot’s Alexa skill uses the new AMAZON.FallbackIntent – this eliminates the need to update the QnABot Alexa skill to accept new utterances. The latest version of QnABot logs what users are saying to your bot. Behind the scenes, we use Amazon Kinesis Data Firehose to store logged utterances to a new index in the Amazon Elasticsearch service. Open Examples/Demos, and choose the LOAD button for the feedback demo. Choose Edit from the top left tools menu ( ☰ ), and open the new item ‘Feedback’. Observe the list of default expressions that the user can input to invoke feedback. Use the Web UI to ask a question, such as: “What happens if I ask an unanticipated question?”. Since we have not entered a suitable answer for this question, QnABot responds with the best match it can find, which, in this case is not very useful. In the Web UI, say or type “feedback”. QnABot offers response options – enter ‘B’ to indicate that the answer was not useful. Visualize the usage logs and feedback using the new Kibana dashboard. Note that it can take up to 5 minutes for new utterances and user feedback to become visible in the dashboard. Choose Kibana Dashboard from the top left tools menu ( ☰ ). Kibana opens in a new browser tab, showing usage history (top), dashboard visualizations of the utterance log (middle), and the user feedback (bottom left and right). Use Kibana to change the time span, customize and build your own visualizations, or to run your own queries. QnABot metrics and logs are available using an Amazon CloudWatch dashboard. Launch the dashboard using the DashboardUrl on the Outputs tab of the master CloudFormation stack. When troubleshooting QnABot responses to your questions, trace the request and response using the logs created by the Fulfilment Lambda function. Choose the menu tool in the upper right of the Fulfilment Lambda widget, choose View logs, and choose the AWSLambda function. Inspect the log messages. Each interaction with QnABot is delimited by START and END messages. Between these messages you’ll be able to find insights into how QnABot processes the question. The QnABot Content Designer allows you to export and import your content using JSON files. Use the export feature to create backup versions of your content that you can use to restore if you accidentally delete items or need to go back to a previous version. You can also use exported JSON files to load content into another instance of your bot to help with testing or blue/green deployments. Or, you might want to automatically create JSON content files using scripts which scrape and reformat content using existing sources like FAQ web pages or documents. Try it! Let’s export all the items that are in the QnABot category (items whose ID starts with “QnABot”). Open the exported file in a text editor and inspect the JSON structure. Add a new item to the qna list, as shown in the following example, and save the file. In the Content Designer, choose Import/Export, and From File. Import your modified JSON file from your local computer. NOTE: Importing items with the same ID as an existing item will overwrite the existing item with the definition contained in the JSON file. In the Content Designer, enter QnABot in the filter field, and inspect the newly imported item, QnABot.003. Let’s take a quick look at how QnABot works. Here’s a diagram of the main architectural components and how they fit together at a high level. The following sections explain how all these architectural components work together for different modes of interacting with QnABot. For additional detail, see the source code and READMEs in the GitHub repository, and use the AWS console to explore the configuration of each of the resources. Amazon Lex allows conversational interfaces to be integrated into applications like our Lex web client. A Lex bot uses intents to encapsulate the purpose of an interaction, and slots to capture elements of information from the interaction. Since QnABot has a single purpose, to answer a user’s question, it defines just one intent. This intent has a single slot which is trained to capture the text of the question (see the discussion of “Tuning the Bot’s Natural Language Processing” earlier). To learn more about how Amazon Lex bots work, and to understand the concepts of intents, slots, sample values, fulfillment functions, and more, see the Amazon Lex Developer Guide. The QnABot Lex web client is deployed to an Amazon S3 bucket in your account, and accessed via Amazon API Gateway. An Amazon API Gateway endpoint provides run time configuration. Using this configuration, the web client connects to Amazon Cognito to obtain temporary AWS credentials, and then connects with the Amazon Lex service. When you use the Lex web client to ask QnABot a question, for example, “How can I include pictures in Q and A Bot answers?”, the web client interacts with the QnABot Lex bot. The Lex bot then invokes the Bot fulfillment Lambda function in your AWS account with the transcribed question captured as a slot. The Bot fulfillment Lambda function generates an Amazon ES query containing the transcribed question. The following example shows the query. The query attempts to find the best match from all the questions and answers you’ve previously provided, using Amazon ES relevance scoring. Matches found in the text of stored questions (nested field: questions.q) are summed and given greater weight than matches found in the text of the stored answers (field: a). The topic value assigned to the previous answer (if any) will increase the overall relevance score for matches on topic value (field t). The Bot fulfillment Lambda function uses the answer field from the item with the highest score to create a response to send back to Lex. If the item also contains an image attachment, a response card is also sent back in the response. The Lex web client responds to the user with either voice or text depending on the mode of operation, and also displays any images attached to the answer. Alexa devices interact with QnABot using an Alexa skill. Like a Lex bot, an Alexa skill also uses intents to encapsulate the purpose of an interaction, and slots to capture elements of information from the interaction. The QnABot Alexa skill mirrors the setup of the Lex bot described above, defining a single intent with a single slot. The Alexa QnA skill uses the same Bot Fulfillment Lambda function as the Lex bot. When you ask a question, for example, “Alexa, ask Q and A, How can I include pictures in Q and A Bot answers?”, your Alexa device interacts with the skill you created, which in turn invokes the Bot fulfillment Lambda function in your AWS account, passing the transcribed question as a parameter. The Bot fulfillment Lambda function queries Amazon ES items as described earlier. The Bot fulfillment Lambda function uses the answer field from the item with the highest score to create a response to send back to Alexa. If the item also contains an image attachment, a card is also sent back in the response, causing the image to be displayed in the Alexa smartphone app. If you use an Echo Show or Echo Spot the image will be displayed on the touchscreen, or if you use Alexa on your Amazon FireTV the answers and images will be displayed on your big screen TV. The QnABot Content Designer UI, like the Web Client, is also deployed to an Amazon S3 bucket and accessed via Amazon API Gateway, and it too retrieves configuration from an API Gateway endpoint. The Content Designer website requires the user to sign in with credentials defined in a Cognito user pool. Using temporary AWS credentials from Cognito, the Content Designer UI interacts with secure API Gateway endpoints backed by the Content Designer Lambda functions. All interactions with Amazon ES and Amazon Lex are handled by these Lambda functions. Fork the QnABot GitHub repository, enhance the code, and send us pull requests so we can incorporate and share your improvements! Usage metrics: Implement custom metrics to track which questions and topics are accessed most frequently. Capture user feedback: Allow the user to report errors in answers, or to report when a given answer didn’t address the question that was asked. Multiple answers: Allow the user to request a different answer by saying “Try again,” or “Next” to instruct QnABot to reply with lower ranked answers. Useful when questions are ambiguous or when there is more than one correct answer. Scrape existing FAQ pages or documents: Write scripts to capture content from existing suitable sources. Automate, or semi-automate the creation of the QnABot JSON format files for importing. Extend QnABot to access public knowledge base services: Tap into Wikipedia, Evi, WolframAlpha, or other public knowledge servers by extending the Bot fulfillment Lambda function to access additional external information sources. Integrate QnABot with Amazon Connect: Lower your support center call wait times by automating answers to frequently asked questions, using QnABot within an Amazon Connect contact flow. (See Amazon Connect and Amazon Lex Integration.) You can also use popular messaging platforms to interact with QnABot. The QnABot uses the chatbot web UI described in the blog post: Deploy a Web UI for Your Chatbot. If you have installed an earlier version of QnABot, you should use the Export feature to create a JSON file containing all your Q and A content. Install this latest version as a new stack (follow above instructions), and use the Import option to load your saved JSON file. After importing your content, run tests to validate that your questions are answered correctly. We enhanced the search query to correct a problem in the first version of QnABot, so you might find that you need to retune some existing questions. After you have validated that the new QnABot is answering questions as expected, you can switch users over, and uninstall the old version. When you’re done experimenting, in the CloudFormation console, choose and delete the master QnABot stack. This removes all of the AWS resources associated with the bot. Be sure to first export any QnA items that you want to reuse later. This blog shares our sample Question and Answer bot, QnABot. We explain how you can use QnABot to create a natural language interface that works with both text and voice using Amazon Lex via your web browser or using any Alexa-enabled device. Now you can try it with your own questions and answers! Please use the comments link to share your experiences with the QnABot – we’d love to hear from you! Bob Strahan is a Principal Consultant for AWS Professional Services. John Calhoun is an Associate Solutions Architect for the AWS Public Sector Partners team. They work with our customers and partners to provide leadership on a variety of projects, helping them shorten their time to value when using AWS.